Vladimir Lenin (born Vladimir Ilyich Ulyanov ) (April 22, 1870 – January 21, 1924) was the leader of Russian Communism and an important theoretician of Marxism. Coming to power in 1917, he became dictator of the Soviet Union. All over the Soviet Union and even to some extent some Western countries, there were statues and paintings honoring his memory; some were removed when Communism collapsed in 1991. Despite the disapproval of the Mensheviks, Lenin's followers continued to raise money through a mixture of bank robberies, kidnapping, extortion, terrorism, and murder. Unlike the leaders of other Marxist organizations, Lenin did not spend the money on his own lifestyle and carefully strengthened his movement. With German help, he returned to Russia after the Tsar abdicated in March 1917 and a short-lived liberal democracy allowed for free elections. At the time, most Bolsheviks were more interested in using the ballot box to gain political power. Lenin rejected elections, and declared, "History will not forgive us if we do not take power now." In 1917 Lenin opposed Russia's continued participation in World War I and advocated proceeding directly to a socialist revolution, bypassing bourgeois rule. He rejected cooperation with the Provisional Government and drove some old Bolsheviks out of the party, while co-opting many younger, more radical members. Joseph Stalin, Grigori Zinoviev, and others rallied to Lenin's side during the elections to the party's Central Committee during the 7th Party Conference in April 1917 and became the new leadership. The Bolsheviks were allowed free expression of disagreements until a decision by the Central Committee was reached, and then no opposition or disagreement was permitted. Lenin now ruled the Bolsheviks from his base in Petrograd (St. Petersburg). In October 1917, Lenin masterminded a coup d'état which overthrew the Provisional Government which had replaced the Russian Empire. In what historian Simon Sebag Montefiore has described as a comedy of errors, the Winter Palace was shelled and the Provisional Cabinet was placed under arrest by a mixture of Red Guards and radical sailors from the Kronstadt Naval Base. Lenin ruled the Soviet Union under Marxism–Leninism, until 1922, when he had a debilitating stroke and retired. In 1918 Lenin ordered to kill all prostitutes. One of his more infamous orders was the 1918 Hanging Order where he ordered the Cheka in Penza to find and publicly hang at least 100 kulaks, and derogatorily referred to them as "bloodsuckers". For a more detailed treatment, see Atheism and Mass Murder. 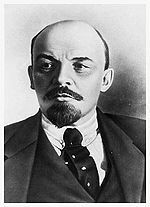 Like Stalin and Mao, and despite his more positive reputation among Leftists, Lenin also wished to exterminate the peasant class, even orchestrating famines to do so, in order to force his will on Socialism. This also proves that Communism, despite the PR, never cared at all for the poor. Lenin, a workaholic who avoided vacations and downtime, died in 1924 following a series of progressively more serious strokes. Joseph Stalin was his even more brutal successor. Before 1917, Lenin thought that revolution was more likely to break out in Russia than in any other country on the continent, and he expected the outbreak of other revolutions in Europe, or at least in Central Europe, after the Russian Revolution. During the Civil War, he considered a short period of War Communism as an extension of the revolutionary situation from which a direct path might open toward socialism. However, after the failure of War Communism he returned to his earlier viewpoint, that is, to the necessity of a transition period. This was reflected in the New Economic Policy (NEP) - which meant a transition including both private enterprise and a market economy. Stalin deemed the transition favored by Lenin to be too dangerous, because it carried with it the threat of a defeat and an eventual restoration of capitalism. In addition, Lenin advocated perpetual civil war to eliminate all "class enemies", with this being in effect with brief pauses until 1953. He also wrote that "Revolutions are the locomotive of history…Revolutions are the holiday of the oppressed and exploited." see also Dictatorship of the proletariat Lenin saw the Marxist concept of the "Dictatorship of the proletariat" in terms of a dictatorship exercised not by a democratically chosen majority but by a vanguard minority revolutionary party, ruthlessly controlled by a few leaders like himself. He eventually accepted the need for a state bureaucracy, and his more extreme opposition to the bourgeoisie led him to favor their exclusion and disenfranchisement to the benefit of the urban working class. Lenin's utopian design of a revolutionary community of virtuosi was a typical political religion of an intelligentsia longing for an inner-worldly salvation, a socialist paradise without exploitation and alienation, to be implanted in the backward Russian society at the outskirts of the industrialized and modernized Western Europe. The Russian Revolution of October 1917 accomplished the institutionalization of a political religion combining a political and sacral monopoly of power and belief. Consequently, the Leninist policy of social extermination of political opponents, ideological rivals, and stigmatized social classes became a sacral obligation to be fulfilled by the new ideological orthodoxy. The beginning iconography of a Leninist sacral tradition praised Lenin as a messianic and numinous leader. This process of iconographic work in progress culminated after Lenin's death in the sacral Lenin cult. The Lenin mausoleum served as the monumental centerpiece of sacral rites and practices to be enacted by the Stalinist orthodoxy. Joseph Stalin's invention of a sacral tradition of Marxism–Leninism qualified him as the only true disciple of Lenin. Therefore, Stalin claimed the monopoly of the infallible interpretation of the holy scriptures, summarized in his own dogmatic performances. In this sense, Stalin's Leninism became itself the religion of the Soviet state. After his death in 1924, Stalin portrayed Lenin as an infallible humanitarian; his writings were viewed as gospel. Museums were devoted to his life and work, cities were named for him, and huge statues and monuments honored his memory. Beginning in 1985, however, the Lenin cult began to crumble. Party chairman Mikhail Gorbachev was a faithful disciple of Lenin, but he now faced the reality that the economically bankrupt Communist state was rapidly decaying. As the Communist nation unraveled, so did the Lenin personality cult. Leningrad residents voted to restore the St. Petersburg name; the once-crowded museums attracted few visitors; and Lenin's philosophy and actions were found less than perfect. In 1991 as Communism fell, the statues and paintings went into cold storage. By 1995 plans were being made to bury Lenin's corpse, which was finally acknowledged to be putrefying just as the remains of any other mortal, as the cult itself fell into "the dustbin of history." His transformation of Russia into the Soviet Union ultimately led to Communism being exported throughout most of the world, and leading to well over tens of millions of death. In addition, there is evidence to suggest the anti-cop violence during the 2010s often encouraged by Barack Obama were derived from similar rhetoric by Lenin. "We must be ready to employ trickery, deceit, law-breaking, withholding and concealing truth... We can and must write in a language which sows among the masses hate, revulsion, and scorn toward those who disagree with us." "The press should be not only a collective propagandist and a collective agitator, but also a collective organizer of the masses." "Our program necessarily includes the propaganda of atheism." "It matters not if 90% of the Russian people perish so long as 10% bring about a world revolution." ↑ "Vladimir Ilyich Lenin" (Russian: Владимир Ильич Улянов, Ленин) was the pseudonym he used after 1900 to disguise his identity. ↑ James Burnham, The Managerial Revolution, (1940). "...at a certain stage in the development of democracy, it first welds together the class that wages a revolutionary struggle against capitalism -- the proletariat -- and enables it to crush, smash to smithereens, wipe off the face of the earth the bourgeois, even the republican-bourgeois, state machine -- the standing army, the police and the bureaucracy -- and to substitute for it a more democratic state machine, but a state machine nevertheless, in the shape of the armed masses of workers who develop into a militia in which the entire population takes part." "...the Social-Democrat’s [Communist's] ideal should not be the trade union secretary, but the tribune of the people, who is able to react to every manifestation of tyranny and oppression, no matter where it appears, no matter what stratum or class of the people it affects; who is able to generalise all these manifestations and produce a single picture of police violence and capitalist exploitation; who is able to take advantage of every event, however small, in order to set forth before all his socialist convictions and his democratic demands, in order to clarify for all and everyone the world-historic significance of the struggle for the emancipation of the proletariat." Clark, Ronald W. Lenin (1988). 570 pp. Volkogonov, Dmitri. Lenin: Life and Legacy (1994). 600 pp. Anderson, Kevin. Lenin, Hegel, and Western Marxism: A Critical Study (1995) 311 pp. Debo, Richard K. Survival and Consolidation: The Foreign Policy of Soviet Russia, 1918-1921 (1992). Pipes, Richard. Russia under the Bolshevik Regime. (1994). 608 pp. Pomper, Philip. Lenin, Trotsky, and Stalin: The Intelligentsia and Power. (1990). 446 pp. Schapiro, Leonard and Reddaway, Peter, eds. Lenin: The Man, the Theorist, the Leader - a Reappraisal (1987). 317 pp. White, James D. Lenin: The Practice and Theory of Revolution (2001) 262pp. Desai, Meghnad, ed. Lenin's Economic Writings. (1989). 363 pp. Pipes, Richard, ed. The Unknown Lenin: From the Secret Archive. (1996). 185 pp. This page has been accessed 85,758 times.